The Annual Spring Stock-Up Sale is Here! 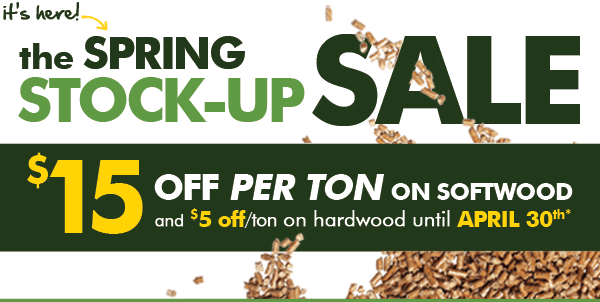 Save $15 per ton on all softwood, and $5 per ton on all hardwood pellets during the Woodpellets.com Annual Spring Buy! (Wood bricks are also discounted by $5/ton!). Many of our customers wait for this Spring sale to make their yearly purchase – and the time has come again. So if you have the room to store your wood pellet fuel this summer, you can avoid long waits during peak season, and save money by ordering now. Hurry: the sale is on now through April 30th! Or call 1-800-735-5387 to speak to an expert! Order must be placed by 11:59pm on 4/30/15. Customer must accept delivery between order date and 5/22/15. Offers cannot be combined. As we are nearing the end of another long heating season – you probably have a pile of empty wood pellet bags stacked high. Are you wondering what to do with them? We have heard that question a lot lately. Depending on your location, your town may accept the bags to recycle. We have a new idea to make some use of all those bags, just in time for springtime and Easter parties: DIY Party Goody Bags! 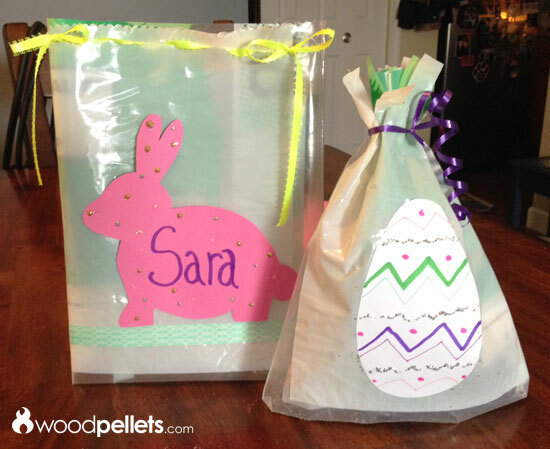 Make personalized candy bags ahead of time for guests, or make blank bags to let kids design their own! This is an easy craft and a way to make some use of those empty pellet bags. Please be sure this activity is done under adult supervision at all times. Depending on the ages of your crafters, it’s probably the safest for you to do the bag construction ahead of time. This way you can leave more time for the fun decorating part, and less time worrying about sharp scissors in small hands. Remember…safety first! If you want to cut out shapes ahead of time, click here for a free printable sheet of shape templates. 1. The kind of empty wood pellet bag you have doesn’t matter. As long as either the top end or the bottom end hasn’t been cut or damaged, any bag will do! You just need one end to be still intact. Cut the bag in half vertically, making two long pieces. 2. Cut horizontally across both pieces to make the same size baggies. It’s up to you how deep you want them to be – so cut where you want. If you have them – use scalloped or zig zag scissors for some extra fun! 3. Flip the bag inside out, and clean off any leftover pellet residue. It’s not harmful – but you don’t want it getting all over the place. Luckily, we had a Cleanfire Douglas Fir bag to work with…so the pellet dust was minimal! 4. Choose the side you want as the back. In our example, the back of our bag is white, which is perfect for a blank canvas. Flip the side you chose to be the back up to face you. Fold the long open side (where you cut vertically) inward as if you were gift wrapping a box. Make sure to pull in the folds in enough to make the baggie narrow enough. No baggy masks or hats! 5. Instead of plain tape, we used decorative washi tape to add in some extra color, and trimmed the top of the bag. This gives the edge a nice finish. Repeat these steps for the other bag, and start over with each empty pellet bag. 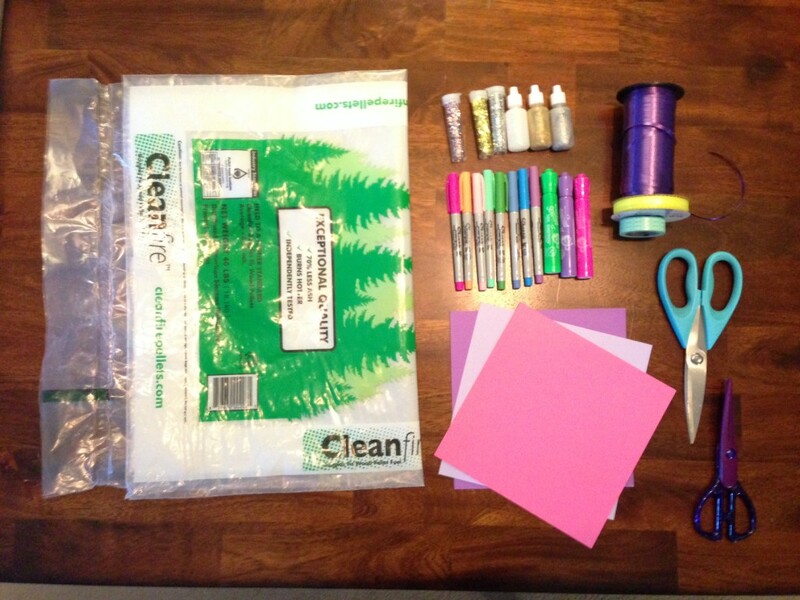 Within minutes, you have a sturdy bag ready for personalization! Set out all the (safe) decorating materials with your blank goody bags and get ready for some creativity! Please share your empty bag ideas with us! Wood bricks can be used alone or as a supplement to firewood in a wood stove. This video is comprised of a series of clips filmed over 75 minutes. A smoldering piece of mostly burned-through firewood is in the back, with three Cleanfire Wood Bricks stacked in front. There is no kindling or assistance needed, due to the already hot firewood ash bed. Is Snow Affecting Your Burning Efficiency? Record snowfall has certainly been tough on those in the Northeast. Slippery conditions, heavy snow piling up, power outages and bitterly cold temperatures are just some of the struggles this winter has presented us with. The amount of snow accumulated in some regions has been crippling. Although the temperatures are beginning to ease up, forecasters are predicting no significant dent in the huge snowbank accumulation soon. 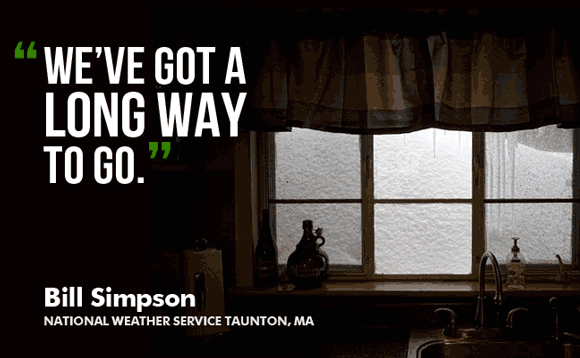 Bill Simpson of the National Weather Service Taunton, MA office explains, “It’s not going to be as significant as people think. It’ll melt, but not a good chunk. We’ve got a long way to go.” He believed there will only be a ten percent snow decrease in the next few days of warmer temperatures. How does all this snow affect pellet stove owners? Heavy snow buildup can definitely affect your stove venting. This is a very common factor with burn issues right now. Unlike wood stoves, pellet stove venting can be either horizontal, vertical or both. Another way snow affects your wood pellets is by through delivery delays. The Woodpellets.com delivery trucks are wide, and they need enough space to safely travel down your road and park. Once parked, the forklift is lowered from the truck to unload the pallet(s) to be brought up your driveway. Of course, there is nothing you can do personally about large snowbanks taking up valuable space on the road. However, you can make sure your driveway is plowed enough for our 9 foot wide forklift. Making sure there is clear space for the forklift to maneuver on will help the driver make a successful delivery – and help you avoid delivery delays.